At some point, everyone will likely have to give notice and quit a job. We have all been there, whether you are miserable in your position, have another opportunity waiting for you or are making a change for personal reasons. Leaving a position is not always an easy thing to do. How do you know when it is the right time to leave? How do you go about actually leaving? Is there a right way to quit? A wrong way? Below I have compiled my top 3 tips for quitting your job. Tip #1: Ensure that you are quitting for the right reasons and that you are ready to quit financially. Are you quitting for the right reason? If you are quitting because you are unhappy in your current position, ask yourself whether you have done everything that you can to change the situation. Have you spoken with your manager? More than once? Have you spoken with someone in Human Resources? Ensuring that you have made every effort possible to ameliorate your current unacceptable work environment will help you find closure from your current position as well as allow you to explain to future employers about why and how you left the position. If you are giving your notice for personal reasons, explore whether there is anything for which you can ask that might help. You never know what you can negotiate unless you try. Would a day working from home help? Would shifting your work hours later in the morning help your commute? Be creative in what you ask for. 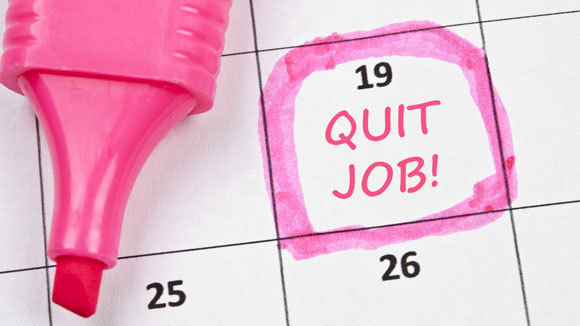 If you are ready to quit your job, you really have nothing to lose and might as well negotiate before you leave. Make sure to craft your request as a positive and value-add proposition by explaining to your boss what opportunities will be gleaned for the business and the department by your working remotely, going to half time, switching your work hours, etc. If your boss is not interested, he/she always has the ability to say no, but if you don’t ask, you will never know what could have been. Can you afford to quit? If you do not have another position already secured, consider your savings. Do you have enough money to live on? Consider your fixed costs and variable costs. Is there anything that you can cut from your expenses to save money until you find another job? Make sure to account for health insurance and other benefits for you and your family that you will need to maintain while searching for your next position. Tip #2: Make sure you know what the policies are regarding length of notice, termination of benefits, any contract specifications such as non-competes and exit interviews. Length of notice: There is no obligation to stay at a position longer than the notice that a contract specifies, whether it’s 2 weeks or 4 weeks. You may, though, decide to stay longer based on the specific projects you’re working on or the transition plan that you and your manager determine. Termination of benefits: Find out about the employee benefits and salary you are entitled to receive upon leaving. Inquire about collecting unused vacation and sick pay, and keeping, cashing in, or rolling over your 401(k) or other pension plans. These details can often be negotiated so consider what you need – health insurance, COBRA, etc. – before you quit. Contract specifications: Know what limits you have on future endeavors related to your current business. If you plan to leave the industry and make a career change, this might not matter, but intellectual property and client data will likely be highly protected by the employer so make sure not to violate any agreements that you have made. Exit Interviews: Always ask for an exit interview. Exit interviews are a chance for you to provide feedback to an employer in a confidential way. If you are leaving because you are disengaged, an exit interview is a time for you to provide feedback in a cool and calm way. You should always be professional and constructive, though, in your feedback to Human Resources if you want your words to be taken seriously. Tip #3: Say and do the right things. Write a letter, deliver it in person: Draft a professional letter of resignation ahead of time and really put thought into it. Not only is it a clear outline of your exit strategy to your employer, but it’s also a nice way to make sure you leave on a good note. Don’t forget, letters of resignation often end up in employee files and can be used later on when your former boss is called for a reference. Make sure they have nothing but the best things to say about you. What to say to your boss: Don’t say much more than you are leaving. Emphasize the positive and talk about how the company has benefited you, but also mention that it’s time to move on. Offer to help during the transition and afterward. Ask for a reference: Before you leave, ask for a letter of recommendation from your manager. As time passes and people move on, it’s easy to lose track of previous employers. With a letter in hand or a LinkedIn recommendation online, you’ll have documentation of your credentials to share with prospective employers. Return company property: Return any company property you have – including keys, documents, computers, phones, and anything else that doesn’t belong to you. The company doesn’t want to chase you to get it back, and you don’t want to be held responsible if it’s not returned in a timely manner. Always remember, the way that you end your time in an organization is equally as important as the way that you begin your time there. Making sure that you are well-prepared, respectful and positive when giving your notice, helps to ensure that your professional reputation remains intact regardless of your decision to quit.